St. Sebastian is a popular saint in Kerala because many churches are built in his name and many people are named after the saint. Formerly people invoked the patronage of this saint when plague was spreading out of control in Europe. Probably European missionaries have introduced the devotion to St. Sebastian in Kerala especially because of the plagues in the past in Kerala. The story of the heroic life of this saint for evangelization and his double martyrdom are worth reflection for our spiritual upliftment. Sebastian was born at Narbonne, Gaul in the modern France. His parents were from a wealthy royal family in Milan, Italy. Sebastian was educated in Milan. He went to Rome and joined the Royal Imperial army under the Roman emperor Carinus about the year 283. He secretly became a Christian and moved through the ranks of the army as a captain of the guard and an imperial officer. He eventually became a favorite of Emperor Diocletian and was promoted to serve in the Praetorian Guard to protect the emperor. Emperor Diocletian hated Christians and ordered to torture and kill them. Hiding his Christian identity, Sebastian supported the persecuted Christians by visiting them in prison, bringing supplies and comfort. Though a successful army officer of the Roman emperor, Sebastian’s passion was to encourage the wavered Christians to keep up their faith despite facing martyrdom and to convert the prisoners to Christianity. Several of them became martyrs for Christ. While Sebastian was serving as a Praetorian Guard, twin brothers Marcus and Marcellian were imprisoned for refusing to offer sacrifice to the Roman gods. They were deacons of the church and were shaken in their faith because of their death sentence and influence of family and friends to give up their Christian faith. They were given 30 days to decide on worship Roman gods or face death penalty. Their parents and friends continued pleading them to renounce Christianity for the sake of their loving and caring family. However, Sebastian made a long exhortation to keep up the faith and face martyrdom. His fiery Spirit-filled speech strongly influenced all his listeners in favor of faith. Sebastian was a gifted healer and converted his fellow soldiers and even the Roman governor. One miracle by Sebastian was regaining speech of Zoe, the wife of Nicostratus who oversaw the prisoners. Zoe lost her speech for six years by a paralysis in her tongue. She fell at the feet of Sebastian who made sign of the cross on her mouth and soon she spoke clearly. This made the conversion of Zoe, her husband Nicostratus, the parents of Marcus and Marcellianus, the jailer Claudius, and sixteen other prisoners. A holy priest Polycarp gave them religious instruction and baptized them. Tranquillinus, the father of SS. Marcus and Marcellianus, got cured of gout when he received baptism. When the governor of Rome Chromatius heard the cure of Tranquillinus, he desired baptism and get cured from his sickness. So, he invited Sebastian, who cured him and converted the governor and his son Tiburtius to Christianity. The governor facilitated the conversion of prisoners, freed sixteen fellow converts from prison, and resigned from his civil position. With the conversion of the Roman governor Chromatius, the Emperor Diocletian came to realize that Sebastian was a Christian. Diocletian arrested Zoe and the other Christians and ordered them for execution. Sebastian, who had close connection with the emperor tried to change the mind of the emperor. Sebastian also revealed that he too was a Christian. Instead of being persuaded, Diocletian was angry at Sebastian for hiding his religious affiliation and being dishonest to the emperor. So, Diocletian ordered that Sebastian be put to death the most painful way. The emperor’s direction was to kill Sebastian by having him tied to a tree for target practice in a training field. Thus, Sebastian was stripped of his clothes, tied to a tree, and treated as “target practice” by archers. His fellow soldiers shot him arrow after arrow till he was full of arrows as an urchin is full of pricks, and thus left him there to die. After the soldiers had left believing that Sebastian was dead, a devout woman, Irene of Rome, came by night to take his body for burial. Irene’s Christian husband St. Castulus was a servant to Diocletian and was also martyred. Irene noticed that Sebastian was still alive. So, she took him to her home and treated his wounds. When the Christians came to know that Sebastian survived the execution and got well, they advised him to leave Rome to save his life. However, Sebastian wanted to meet with the Emperor Diocletian to preach him the gospel so that he might convert the emperor to Christianity and make him change his approach to Christians. Sebastian hid in a stairwell to meet and talk to Diocletian in private. The emperor was surprised to see Sebastian whom he executed remained alive. Though Sebastian tried to preach to Diocletian, he was not convinced. He told his soldiers to beat Sebastian to death with clubs and then throw his body into the sewers. The soldiers beat Sebastian with heavy clubs until he was dead. Then they took his body and dumped it into one of the city’s sewers. He was martyred in 288. Soldiers threw Sebastian’s body in the drains so that Christians should not revive him to life again or celebrate his martyrdom. But St. Sebastian appeared in a vision to St. Lucy (Lucina), a Christian widow and told her the place where she would find his body hanging in a hook. She was asked to wash the body and bury it at the catacombs by the apostles. She and her servants did according to the instructions of St. Sebastian on the same night in secret. He was buried along the Appian Way in Rome. In 367, around 80 years after St. Sebastian’s death, Pope Damasus I built a basilica at his burial site. The Basilica of St. Sebastian in Rome exhibits some relics associated with St Sebastian, including an arrow he was shot with and part of the pillar he was tied to. Some relics from his body were shared with a community of monks in France. His skull was sent to a German monastery where it was placed in a special silver case in 934. St. Sebastian is a "Pre-Congregation" saint. That means he was venerated as a saint before establishing the modern investigations performed by the Congregation for the Causes of Saints. Pre-Congregation saints were canonized by local bishops, primates, or patriarchs, often because of popular devotion. St. Sebastian is specially appealed as a protector against the plague. A seventh century plague attack in Pavia, the then capital of the Kingdom of Lombards, was stopped by building an altar to St. Sebastian in the Church of Saint Peter in Pavia. They built the altar because a man received a revelation that the plague would cease if the people raised an altar to St. Sebastian. Historical records show that the intercession of St. Sebastian protected the City of Rome from a plague in 680. The Bubonic Plague, also known as the Black Death, killed around 75 million people in Europe in the 14th century. During those days people were unaware of how the disease was spread. The random occurrence of the sickness was compared to being shot with black arrows by gods above. Christians also adopted this pagan concept and sought the help of St. Sebastian who was associated with the survival from archery. Since St. Sebastian was a brave believer and dedicated soldier, he is patron saint against plague and illness, of archers, armorers, ironmongers, police officers, soldiers, athletes, the dying and the Pontifical Swiss Guards. Saint Sebastian’s feast day is on January 20th. As a young and good-looking soldier, he is a favorite subject of sacred art. 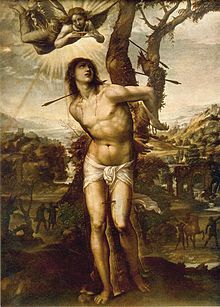 In artwork, St. Sebastian is depicted with arrows shot into his body, tied to a post or a tree. His second execution is almost never portrayed. The other artwork of St. Sebastian is his body with arrows being saved by Saint Irene. 1. Church that we belong to has been nourished by the sweat and blood of Jesus Christ and many martyrs and saints who followed him. Now it is our turn to nourish this church by our works of brave Christian witnessing. 2. St. Sebastian is a typical example of lay ministry in the church. He could encourage the persecuted Christians while they were wavering in their faith and convert prisoners, soldiers and officials because of his secular job. Missionary work of lay ministers can reach out to areas that are unreachable to the clergy and religious. 3. Though we seek the intercession of St. Sebastian for favors, we must keep in mind that he is interceding for us before Jesus, the only mediator between God and humans. All the blessings we get through St. Sebastian or any other saint is coming from God through Jesus based also on the merits of the saint. Our devotion to saints and martyrs should not supersede our worship of God through Jesus Christ.